Sarah @ Just Me posted the cutest idea that I was going to steal borrow and then I saw that she'd tagged me anyhow. How lucky is that?! Oh yeah, it's an oldie! I love old photos so I have scanned quite a lot of Mum's and my Nan's photos. 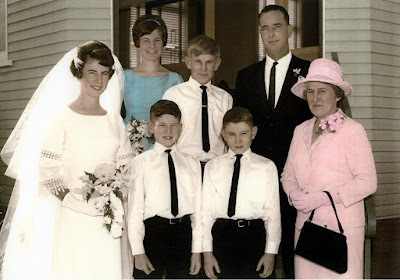 I'm still trying to get some of Grandma's (that's her in the pink) and my mother-in-law's. So...about the photo. This is my Mum's family in 1968. My Mum is in blue, she is 19. She was a bridesmaid for her elder (by 2 years) sister. Her three brothers are in the middle. And my Grandfather (who we lost almost 5 years ago) and my Grandma are on the right. This was a black & white photo that was coloured by hand. Don't you love how they did that? It ends up looking like a mix of a photo and a painting. I love the fashions from the 60s and I think this photo is just gorgeous. Mum had it on the wall when we were growing up and I always admired it. By the way, my aunty made her wedding dress. Wasn't she clever? Mum told me there were a few hissy fits before she finished it and I think it was the last thing she ever sewed!! Love your photo. You have inspired me to scan in a few of the old photos. I have posted my photo now too. I love this photo, I had a portrait done of my eldest daughter in about 1974 that was black and white and hand coloured. But this one just pops. Will get on to is asap! Love your pic. Don't you love it how they used to colour the photos? My Mum has some similar. Must go through her stuff, borrow it and scan it in myself. Never thought of doing that before!